India doesn’t write romance. There’s none of that confusing touchy-feely stuff in her science fiction novels. Hell, she doesn’t even read romance; and as for the lesbian aspect, she’s not sure how to define her sexuality, but if she’s a lesbian, then she’s far enough in the closet to be considered a hanger. Tegan is thrilled to have the opportunity to write alongside another author in a quaint cabin in the mountains, though it’s a challenge to be with the awkward and socially-inept India. Not that Tegan views herself as anyone’s fantasy; she’s on crutches, and who would be interested in a cripple? Her deeply romantic fantasies are all lived out on the page. Neither woman can begin to imagine the changes afoot, once their paths cross. 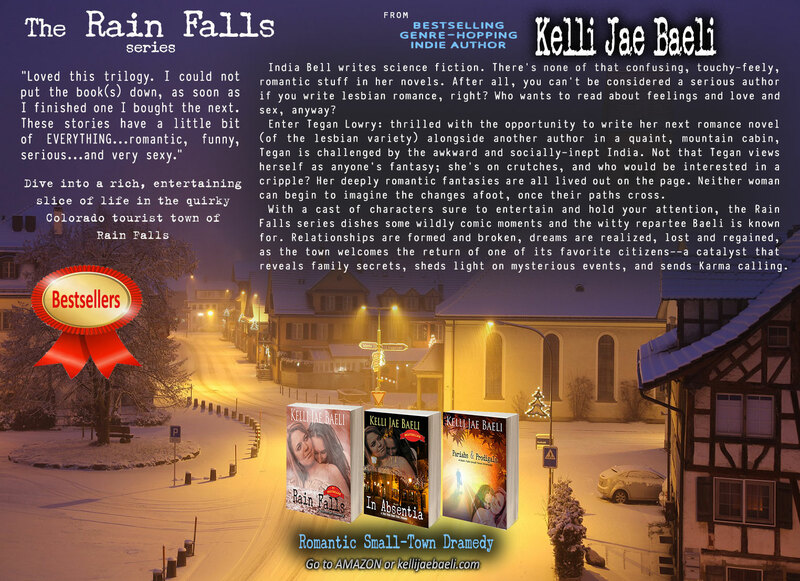 With a cast of characters sure to entertain and hold your attention, the Rain Falls series dishes some wildly comic moments and the witty repartee Baeli is known for. In these first three books, relationships are formed and broken, dreams are realized and lost and realized again, while the town welcomes the return of one of its favorite citizens–the catalyst that reveals family secrets, sheds light on mysterious events, and sends Karma calling. Dive into a rich, entertaining slice of life in the quirky Colorado tourist town of Rain Falls. "Poetry is often the karaoke of the literary world."